Iranian President Mahmoud Ahmadinejad has ordered an immediate end to snap visits by international inspectors to Iran's nuclear plants. He made the move Saturday, hours after the 35-nation board of International Atomic Energy Agency voted 27-3 to report Iran to the United Nations Security Council for its alleged efforts to make atomic weapons. Five countries abstained. 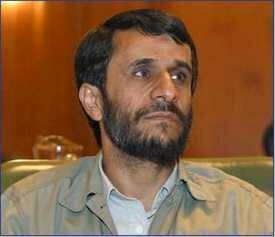 Mr. Ahmadinejad ordered voluntary cooperation with the IAEA suspended as of Sunday. He also ordered Iranian engineers to prepare for the full-scale production of enriched uranium. Iran says it wants low-grade enriched uranium to make electricity, but Europe and the United States allege Tehran wants highly-refined enriched uranium to make an atomic weapon. Iran says its nuclear program is only for peaceful purposes. Shortly after the vote, a top Iranian nuclear official, Javad Vaeidi, said Tehran may no longer consider Moscow's proposal for Iran to enrich uranium in Russia, but Russia says its offer is still open.